Previously I reviewed Zuru's Xshot Bug Attack Rapid Fire, giving it a good grade. At long last, I found its companion blaster in the line, the Eliminator. For $15 at Kmart, it seemed like a good buy. In reality, it's just ok, especially since the pistol is available. The shell itself is very high quality. with faux wood texturing on the stock, rough bumps and surfaces on the grips for both hands, and smooth blue "bug juice" pieces on the outside. It's possibly the most impressive blaster shell I've seen to date from Zuru. 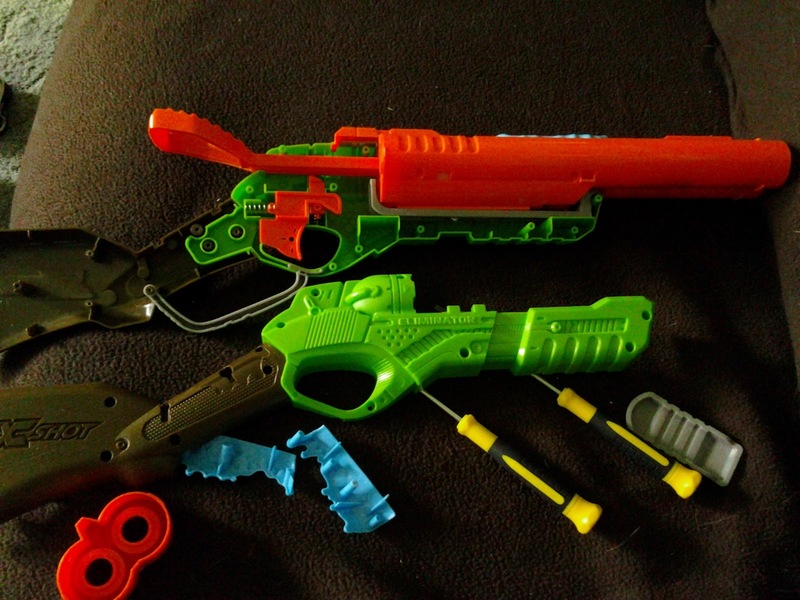 The trigger guard might be too small for bigger hands, but it is its own piece and can be removed if you so desire. Initially, the setup appears to be the same as that of the Lanard Double Barrel Blaster. 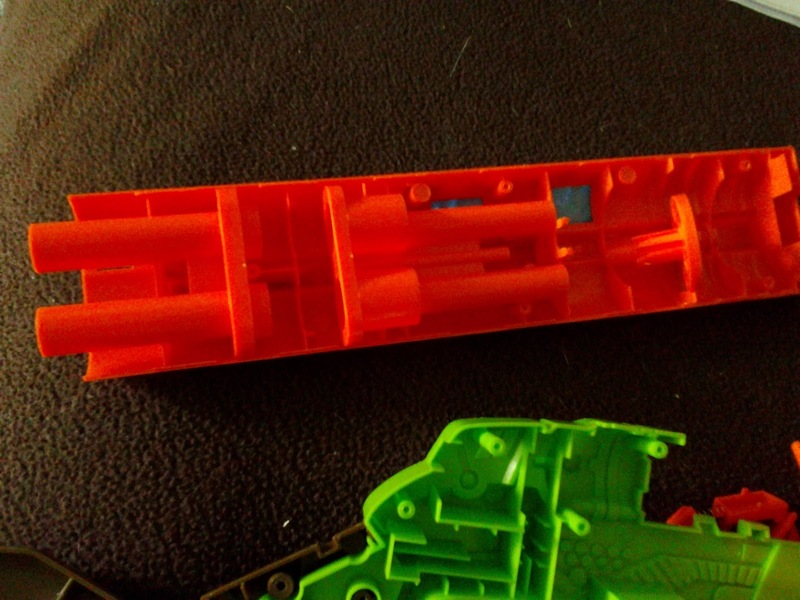 In fact, the entire handle of the Eliminator is part of the plunger, making it extra mass for the spring to move. In addition, the DBB had a revolving plunger tube as its barrel selection mechanism. 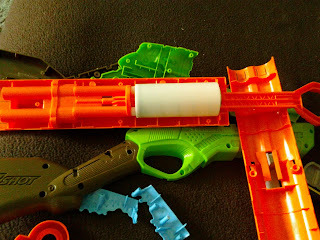 In the Eliminator, the gray plastic arm underneath the barrels connects to a selection mechanism in front of the plunger tube. It consists of a spinning wheel with 6 positions; every other position has a hole to permit airflow. It's actually nearly the same as the mechanism in Zuru's Xshot Vigilante. 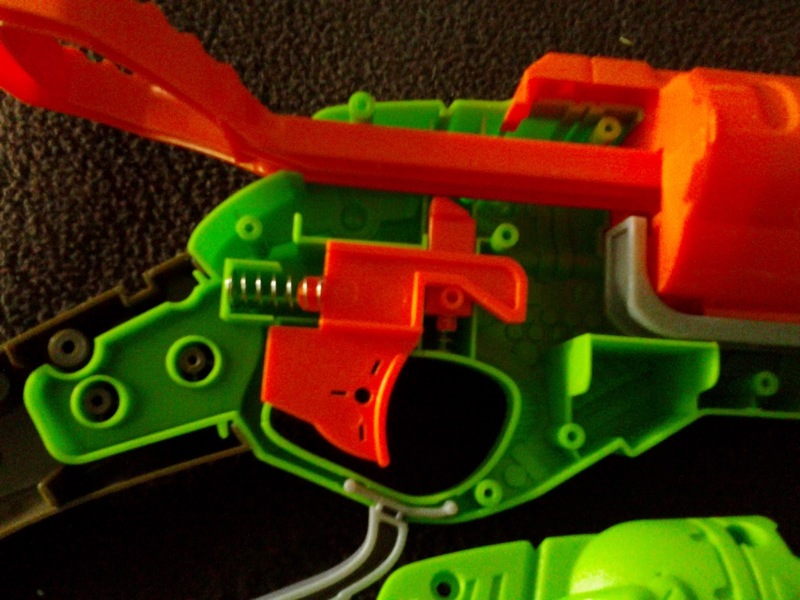 It's an effective solution, but the layout within the Eliminator adds quite a bit of dead space. 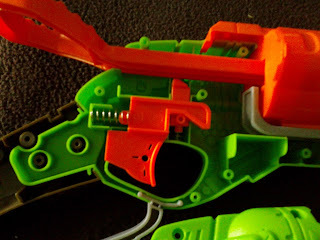 In addition, there's nothing sealing up the barrel selecting mechanism - any obstruction in the barrel, including darts, causes air to leak out this area. Sadly, that limits how much power and the length of barrels you can use when modding this blaster. It won't stop me from trying, though. The plunger tube measures roughly 1 7/16" in diameter, and has a draw just short of 2 1/2". So by all appearances, this could be turned into a primary of sorts. 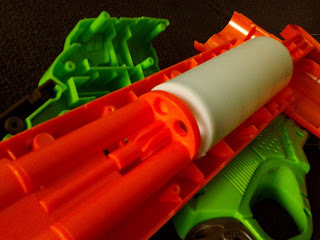 The barrels and the tubing make a tight friction fit together. This is also where the two air restrictors sit. They were removed in this picture. So, how does it perform? With the included Excel darts, I was hitting speeds of about 61 feet per second, and 70 fps without the ARs. With Elite streamlines, it was 58 fps with AR and 65 without. In the end, the Eliminator slings darts about as well as the Rapid Fire. However, it has 4 fewer shots before reloading is needed, and is $3 than the pistol on the shelf beside it ($5 if you skip Kmart and grab the pistol at Dollar General). In its stock form, I can't recommend the Eliminator. But it has plenty of unrealized potential going for it if you want to put the time in. 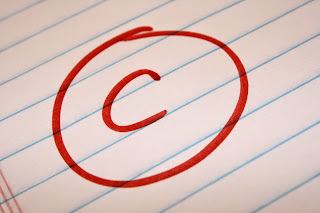 EDIT: Depending on how well the Eliminator performs once modded, I may raise its rating to a B. As you may have noticed, the blog hasn't been updated recently. 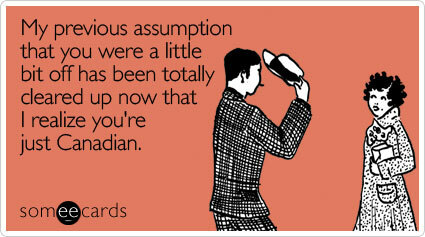 That was for good reason, however. 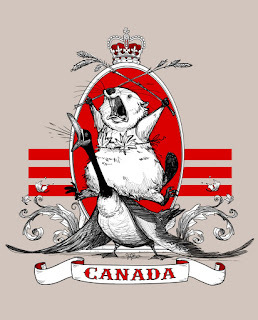 If I wasn't working, I was preparing things for a war in Canada. And you know how serious things can get up there! Just wait until the moose show up. We played at Erindale Park, in Picnic Area A (with a permit for most of the day) and had a fair bit of fun. Three members of the "old guard" were there - k9turrent, Curly, and myself. 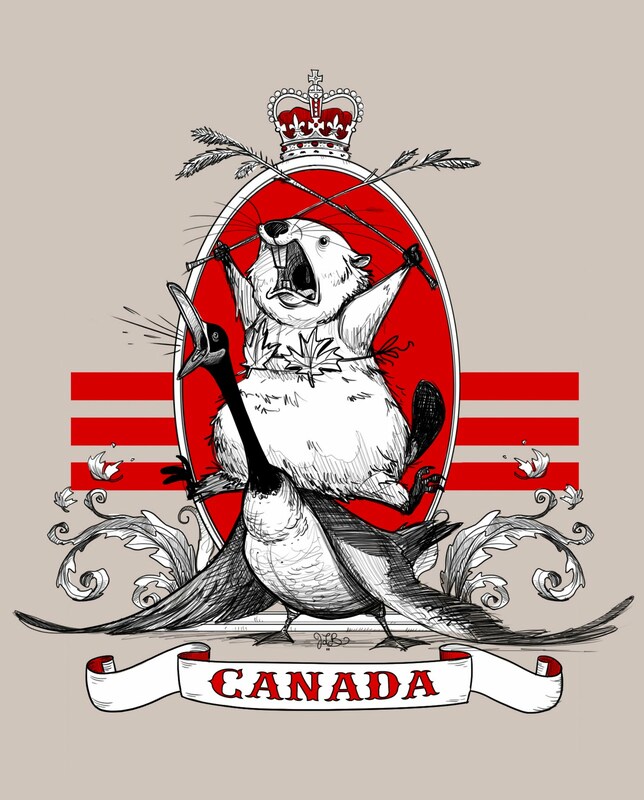 We had a grand total of eight people - certainly not the fifty-something of Canadian wars past, but a good start after a few years of no wars in the area. As it currently stands, we hope to have a war happening every few months. As an American, I can obviously only come so often, but hopefully I can lend support when possible. Here's footage from just a few of the many rounds we played! All in all, it was a fun weekend. I even managed to find some blasters that aren't here in the US yet. So I'll have lots of reviews on the way!